Seattle Makeup Artist Kat St. John offers On Location Makeup and Styling. During the slower months leading up to a crazy wedding season, I always take advantage of my free time to do some creative and different projects. During the Summer (I don't know about other freelance artists) I lose track of my social life, particularly with my 9-5 friends. This is a way for me to hang out with my friends, while flexing a little bit of creative muscle.. The model for this look - Emilie, is a good friend of mine & collaborator. She has always been so gracious in lending me her face to do fun makeup looks. Not to mention, she ALWAYS has the best wardrobe/ accessories. First we started off by setting her hair to achieve the final look. While she was sitting there I said "Oh my gosh, you are so channeling the late 60's housewife". I quickly slapped on some NARS "Desire" blush and lipstick, my FAVORITE pink ever made by MAC: St. Germaine. I look down at the floor at this rad scarf she brought, so I decided to snap a few creative shots through my holes prisms (which are plastic and awful) to shoot some off the wall/ psychedelic stuff. Here she is channeling "Magda" (only way younger and less tan). *If you are unsure of who Magda is: click here. So, again, it is always a good idea to carry a few colors that are bright, even if you don't use them all the time. You just never know. The next look was inspired by a dress her mother wore to their wedding reception, which I thought was so cool. Naturally that led us to the 60's with Emilie's already blonde hair and awesome long bangs. I dug through my kit to find my blue eyeshadow, and found some individual lashes by Monda to put on the top and bottom corner lashes of her eyes so as to not be too extreme (or literal). I don't really carry these in my kit, just at home for creative shoots and whatnot. They take me a while to put on, but they're so great for this kind of work, I was very excited to finally use them! Another thing I don't use too often in my kit? White Eyeliner. I have a retractable pencil I purchased from NYX last year, its a stellar pencil if you're looking to experiment and not spend a lot of money. *Tip: I like to use flesh colored liner in the waterline instead of white for a more natural look, but white is great for a little more drama especially with a pin-up or retro look. At one point after I do Emilie's hair, you hear me gasp and then run out to my living room, dig through my shelves and get my Kevyn Aucoin books. I sit down and flip through "Making Faces". There is this photo of Christy Turlington that I have LOVED forever and I have always wanted to do a shoot like this. Even though I will never be able to replicate this masterpiece, I pull inspiration from it. You take a small piece away from something that really stands out or speaks to you and run with it. For me? It was the lashes and the blue eyeshadow. 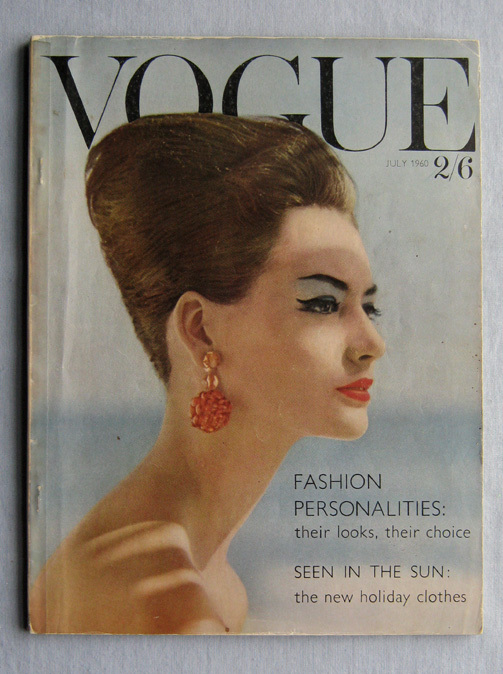 We moved onto old advertisements from Revlon, and vogue covers. The colors were so different then. It was bold and feminine. It made a statement. And the progression into the colored eyeshadow seemed fast and extreme. Kinda of love that. One of my favorite things to do is period pieces. So, the ideas just started to pour out. 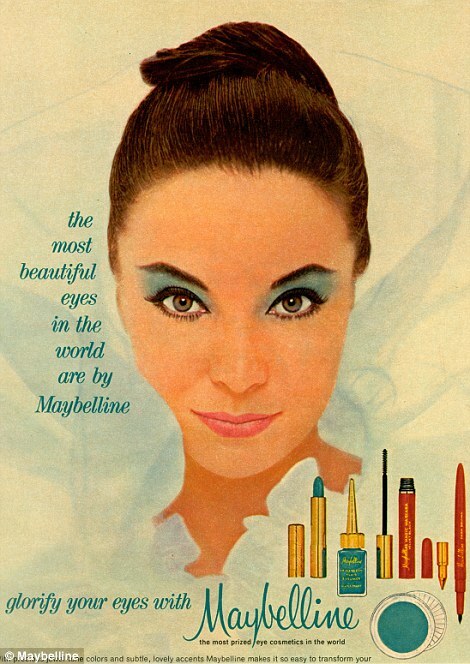 We looked up the photo and old ads from the 1960's. Blue Eyeshadows up to the brow, some of the more hipster looks included heavy lashes, on the top and bottom like Twiggy. We wanted to keep the look soft. Her hair already was the perfect shade of blonde, longish bangs, with face framing layers, I immediately thought of Bridget Bardot and her amazing voluminous hair dos.